Cou Blanc – (coo blanc) literally “white neck” – white front quarters and black hindquarters with black or gray markings on the head. Cou Clair – (coo clair) Literally “clear neck” – front quarters are tan, saffron, off-white, or shading to gray with black hindquarters. Cou Noir (coo nwah) literally “black neck” – Black front quarters and white hindquarters. Sundgau – (sundgow) black with white markings such as underbody, facial stripes, etc. Pied – spotted or mottled. Chamoisee – (shamwahzay) brown or bay – characteristic markings are black face, dorsal stripe, feet and legs and sometimes a martingale running over the withers and down to the chest. Spelling for male is chamoise. 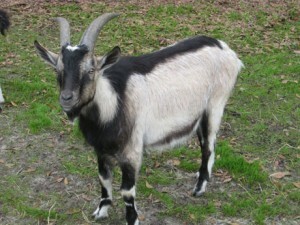 Two-tone Chamoisee – light front quarters with brown or grey hindquarters. This is not a cou blanc or cou clair as these terms are reserved for animals with black hindquarters.